That is Emily in a closet on a shelf in one of her wintering places. She is more often on top of the shoes below her on the floor or in the little space on the floor in the lower left in the picture we call her garage. Emily likes to sit on shoes. If only all turtles were this easy to deal with in winter. This was originally a difficult subject to cover. Part of the reason was because we were still learning about hibernation. Another reason is because you may try our techniques unsuccessfully and loose turtles. We don't want that to happen. The techniques presented in this tour are working well for us. Let us begin with defining hibernation as we will use the term because there is some discussion in the scientific community as to whether reptiles and amphibians "hibernate" like mammals (cold blooded animals vs. warm blooded animals). We will use the term hibernation simply as the inactive state used by turtles to get through cold periods in winter in a cold condition. This is different from aestivation which is what turtles do to get through periods of inactivity in warm months when it's hot and dry. Turtles are said to aestivate when they dig in when their pond dries up in summer. A pet turtle who would normally hibernate and is kept warm by bringing it indoors many be inactive and not eat; this state is called brumation. It sounds more complicated than it is. Bare with us. First we must answer the question of why we allow our turtles to hibernate. As pet owners who truly care for our turtles we only have one reason to allow our turtles to hibernate - we do not have adequate space and setups to bring all our turtles inside our house for the winter months. This is the only reason. Yes there are theories about the reproductive cycles of turtles that say they need a period of hibernation to reproduce. Straight talk. If our turtles do not survive the winter, they will not reproduce. And most turtles can reproduce more than once in a season and some do not reproduce every season. As pet owners who love baby turtles, this is not our reason to subject our turtles to the risks associated with hibernation. So who hibernates and who does not. If you have read our other tours, you know that we do not allow baby turtles to hibernate. Likewise we do not allow smaller juvenile terrestrial turtles such as box turtles to hibernate. Their growth rates are slow enough that they may come inside for several winters. Juvenile water turtles grow more rapidly and outgrow our aquariums sooner. They spend at least one winter indoors. Sick or injured turtles will also come inside if they are not inside already. There are several different means by which turtles breath during hibernation. It varies by the environments in which they normally live and spend winters in such as box turtles on land verses painted turtles in water. If you want to learn more about this subject, you will have to do some reading elsewhere. It is more than we can present based on our own first hand observations. 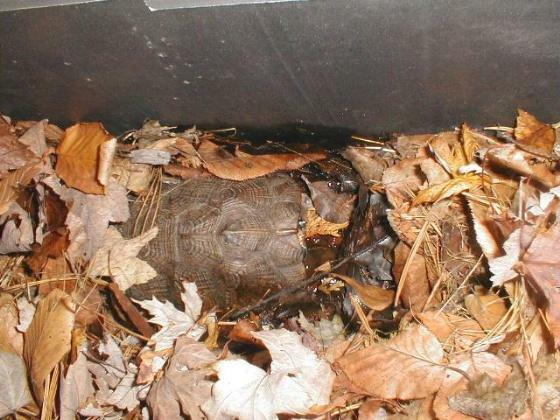 We allow our box turtles to hibernate outside in a natural condition in a pile of leaves. Because we want to provide an enhanced condition for them without being artificial, we have constructed a three sided pit inside a large turtle pen in which we place leaves. The wood sides reduce the intrusion of tree roots and maintain the height of the sides. 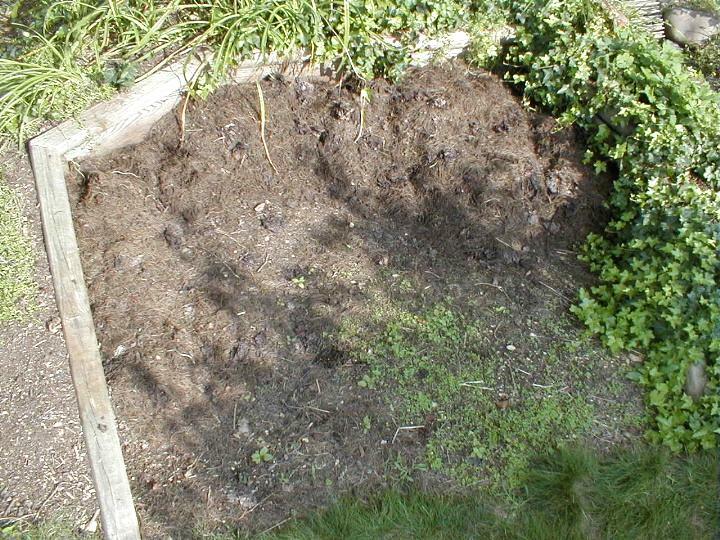 It takes advantage of a moderate slope; the bottom of the pit is level with the down hill side of the pit. 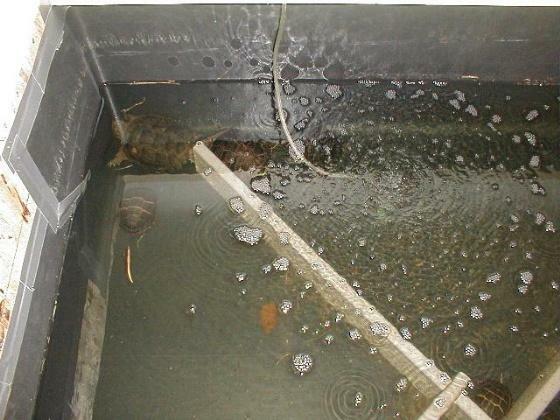 This allows easy access for the turtles and insures that rain water will not puddle in the pit. We sometimes get heavy rain on top of snow when the ground is frozen. A pit below grade would hold water and possibly drown turtles. We must keep in mind that pet turtles housed outside in a pen live in an altered world. They live outdoors confined in a limited space and cared for by us. We force them to rely on us for their food, water, and environment. It should be no surprise when we get into routines together. This is the case with our hibernation pit. It is a year round part of their environment that is changed seasonally and they use it according to their seasonal needs. Our picture tour begins in August. 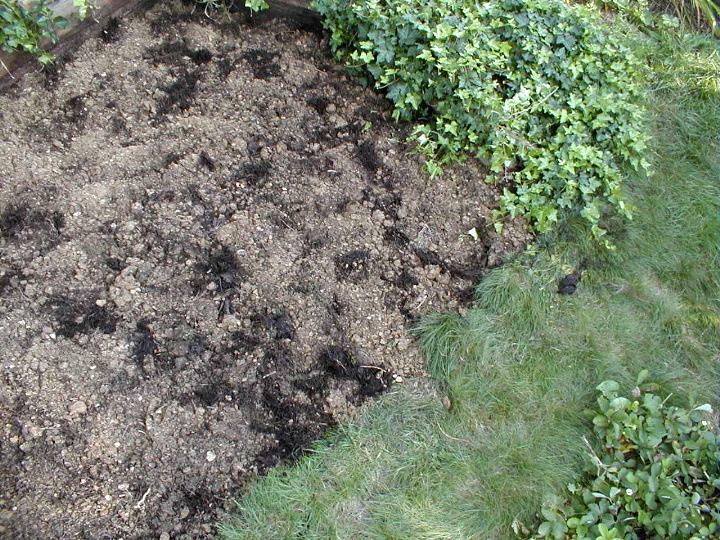 The leaves and pine needles that decompose over the summer are used as compost in the gardens. Some remain in the pit to provide a soft landing for turtles that drop into the pit. 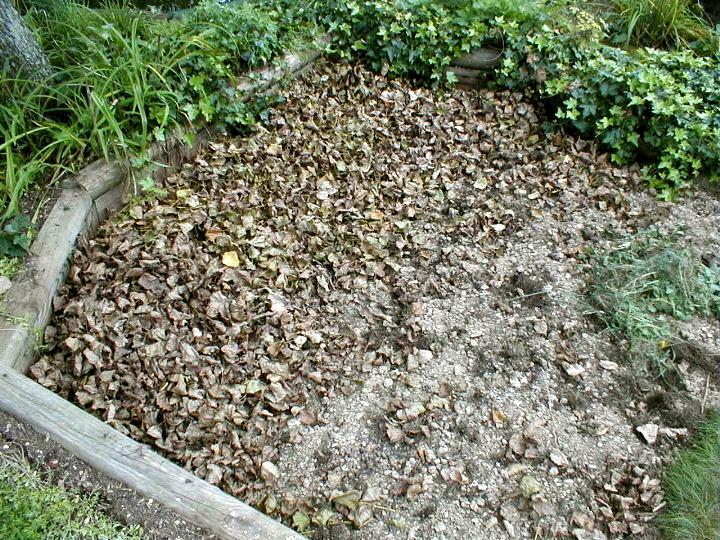 Winter preparation begins in August by removing most of the remaining decomposed leaves. 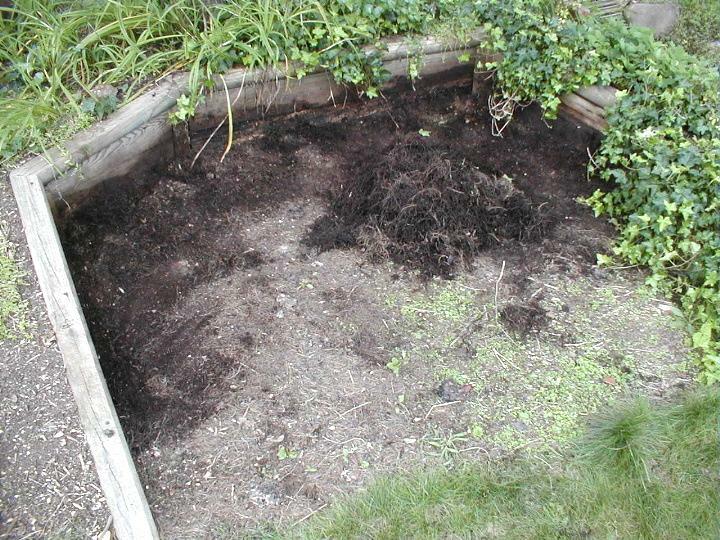 Some compost is turned under the soil to improve the soil for digging and drainage. We are fortunate to have a poplar tree that begins dropping leaves in August. These leaves are placed in the clean pit and will be the only leaves available until October. The turtles immediately begin using the new leaves to hide in. These early leaves will provide cover for many cool nights before more leaves are abundant. By the time autumn leaves are abundant, many turtles are using the new leaf pile including some water turtles. In October leaves and white pine needles are added to the pile. We try to use leaves like oak leaves that do not mat down and become a soggy wet layer like maple leaves. White pine needles are good for mixing with the leaves to keep them from mating. We want an insulating pile of leaves that allows air and moisture to reach the turtles. We have observed that the turtles hibernate at the bottom of the leaf pile not up in the leaves. They dig into the soil so that the soil covers their shell openings and exposed limbs. The tops of their shells are generally not covered by soil. They do the same thing if they bury in the leaves for short periods of time in the spring or summer. In spring they move slowly to the top of the leaves. They often emerge for short periods on sunny days before leaving the leaf pile for the season. There is no great trick to building a leaf pile. Most leaves will do. We do not use any green leaves, green plants, grass clippings, or weeds. 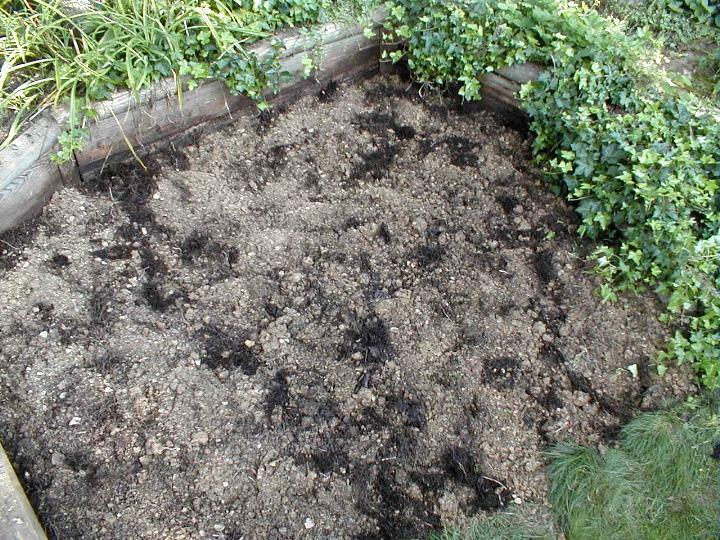 Green plant material will generate heat and mold. We do not wish to generate heat but rather reduce the penetration of cold and maintain an stable cold temperature. It's similar to the reasons we mulch gardens. We also remove pine cones, sticks, and branches. The top of the pile is open to the weather. We allow are adult box turtles and older juvenile box turtles to hibernate in the leaf pile. These include eastern, three-toed, and Gulf Coast box turtles. Ornate box turtles do well too. Other turtles will use it if allowed to. When mixing autumn leaves with the early leaves, we find snapping turtles, wood turtles, and painted turtles already dug in. Most turtles can hibernate in the leaf pile. We will cover the water turtles below. The leaf pile does settle and some blow away. By the end of November we are done adding leaves and the turtles have settled. They may come out on warm days. Turtles found walking around are tucked in before nightfall if the night time temperature is expected to be near freezing. Some turtles leave the leaf pile and dig in elsewhere. For this reason we place more leaves in their favorite hiding places around the pen. 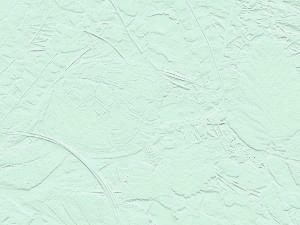 In winter snow cover helps reduce the penetration of cold and maintains a steady temperature. One winter we used an indoor/outdoor thermometer to monitor the temperature at the bottom of the leaves. The temperature held steady around 32 degrees F.
In the spring we are always happy to see our turtles emerge. This is usually about Good Friday. Good Friday varies on the calendar, but this has become our tradition. As the days warm, the leaf pile stays cold. We begin removing some leaves as turtles emerge. They will not leave the leaves until the day lilies nearby are high enough to hide in. The growth of the day lilies is an indicator of the amount of warmth we have had rather than the amount of cover available to hide in. Once the turtles leave the leaf pile in the spring, they seldom return to it over the summer. 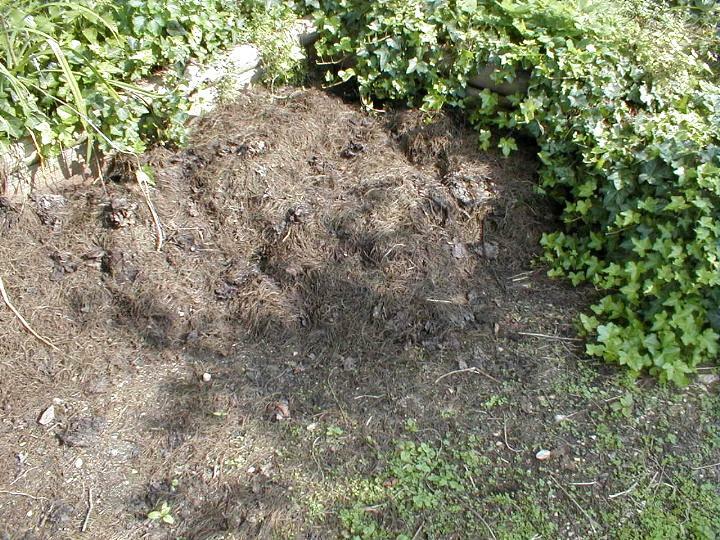 As it begins to decompose, they do not bury themselves in it unless the weather is hot and dry. It is the cool moist place to dig in if needed. The survival rate of our box turtles hibernating outside is excellent. We have not lost any adult box turtles outside in a dozen years. Some emerge needing some extra care such as clearing their eyes. Now that we no longer allow water turtles to hibernate in the leaves intentionally, we have not lost any water turtles outside. We do average about one unfound water turtle outside a winter. Water turtles can hibernate in a garden pond just as pond fish do. The pond must be deep enough so as not to freeze solid or to freeze down to the level of the turtles. An air hole must be maintained in the ice at all times to allow the exchange of dissolved gases in the water with the outside air. We do not have such a pond and refer you to other sources for winterizing garden ponds if you wish to use this method. For many years we allowed our water turtles, wood turtles, and spotted turtles to hibernate in leaf piles with mixed results. Some years they did well and some years we lost turtles. The reasons are not entirely clear. We do know that some turtles were chewed on by rodents and some did not stay settled in the leaves. Wood turtles and spotted turtles may crowd into water bowls rather than go into the leaves forcing us to remove all water. 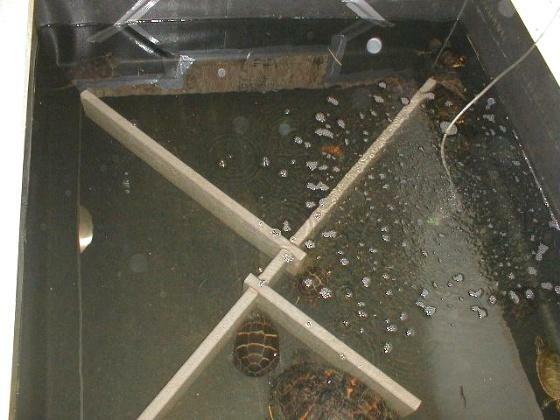 We then tried placing some turtles in tubs of water equipped with aquarium air bubblers in our unheated basement. 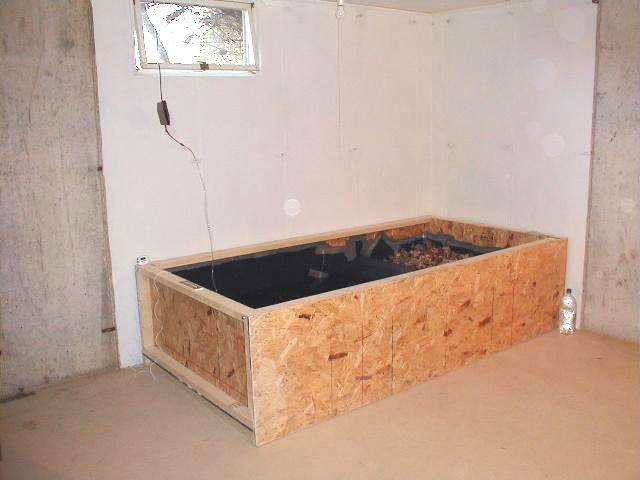 Others were placed in tubs of leaves in the basement. This works, but it is not without risks. Who hibernates in the leaves and who hibernates in the water? Where do we put wood turtles and spotted turtles who need very high moisture but may choose to bury in the leaves. Some water turtles also prefer burying in the leaves. If turtles are in tubs of moist leaves, they will need access to water so they do not dehydrate. 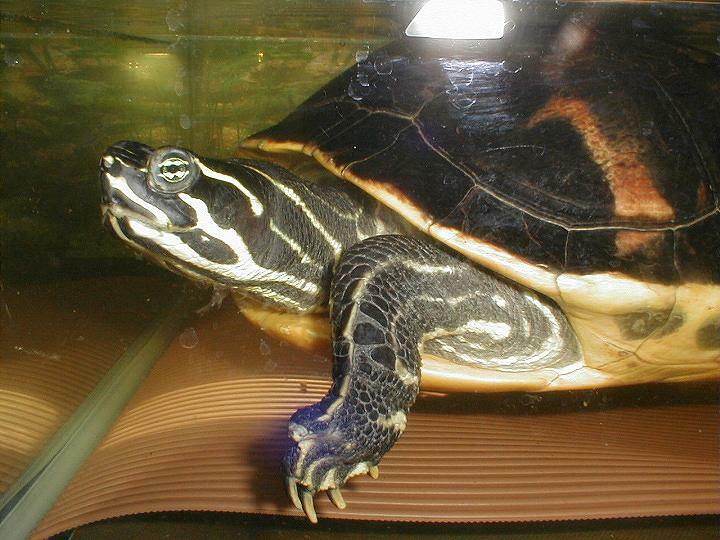 Turtles in water may wish to leave the water or sit out similar to basking. Turtles spending the winter in a basement must be monitored periodically to insure that they are in good health. 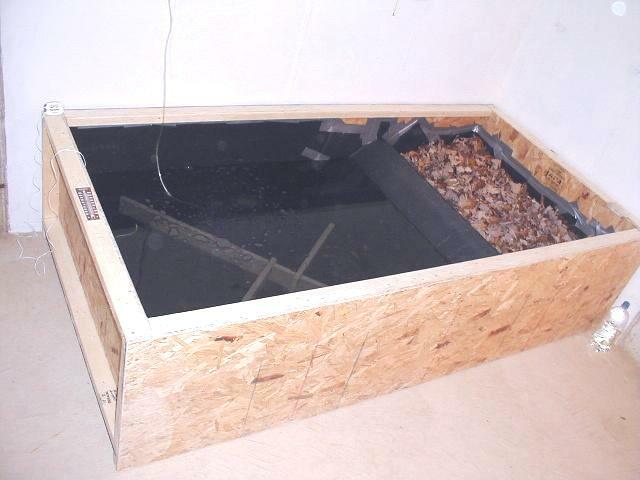 We decided to give our water turtles a choice of environments in our basement so we built a large box and lined it with a rubber pond liner. It measures 4' by 8' by 2' high. It is divided into two compartments separated by an incline covered with wire hardware cloth for easy climbing. 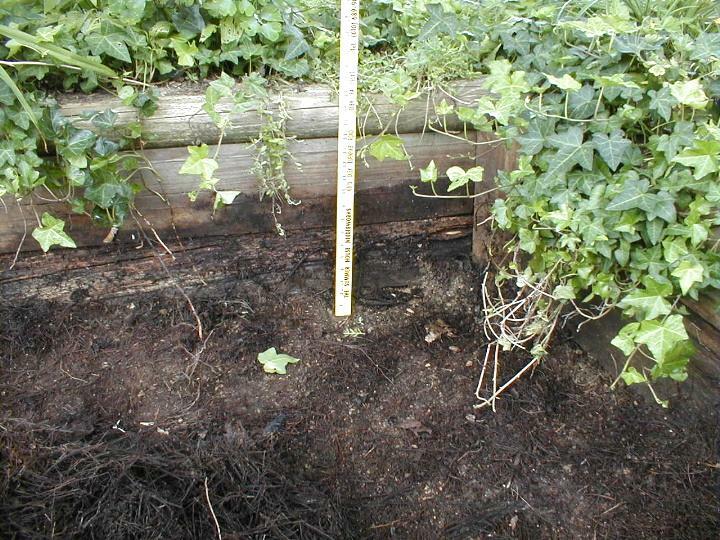 One side is filled with water to about 9" deep and the other side is filled with moist leaves. 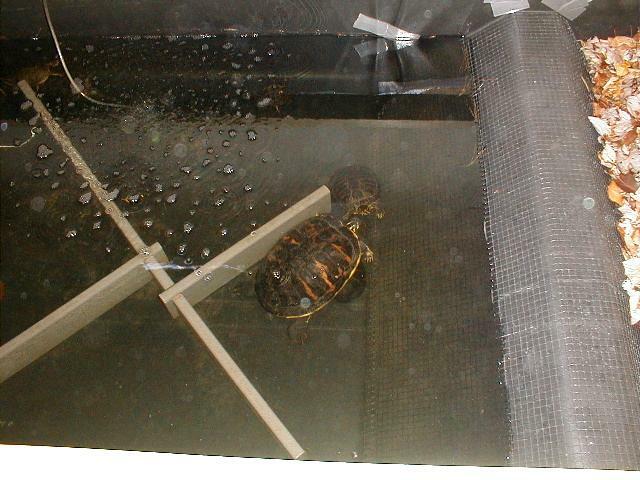 The turtles may sit on the divider and move freely between the water and the leaves. 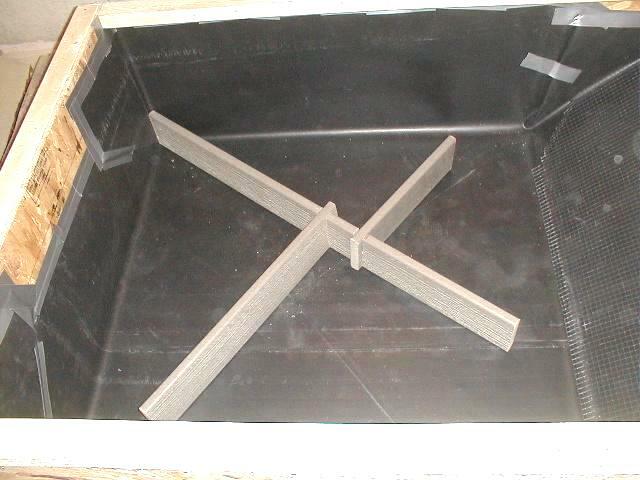 The water compartment has dividers made with plastic lumber to create additional corners to hide in. Air from a bubble stone agitates the water gently so there is no water current. We call this elaborate box "the ark". It sets below a basement window which provides some daylight and fresh air. The temperature in the basement will stabilize at 45 to 50 degrees F. A cooler temperature can be achieved by opening the window more. At this temperature, some turtles will move about and respond when a light is turned on. The ark is filled with a garden hose and drained with a submersible pump pumping the water outside through a garden hose. The small amount of water remaining after the submersible pump can no longer pump is scooped and sponged out leaving the ark clean and ready for the next season. Filling and draining are quick and easy. We are not suggesting that an elaborate enclosure like the "ark" is necessary. We feel a need to go the extra mile to insure the healthy survival of our turtles so that we can share our techniques with you. Giving the turtles a choice of water, damp leaves, and a place to sit above the water has worked out very well. After five seasons of use, we are happy to report a 100% success rate. No lost turtles in the ark! Some juvenile turtles we bring inside for the winter become less active and do not eat or eat very little. They are alert to our presence, but do not come running for food or attention. 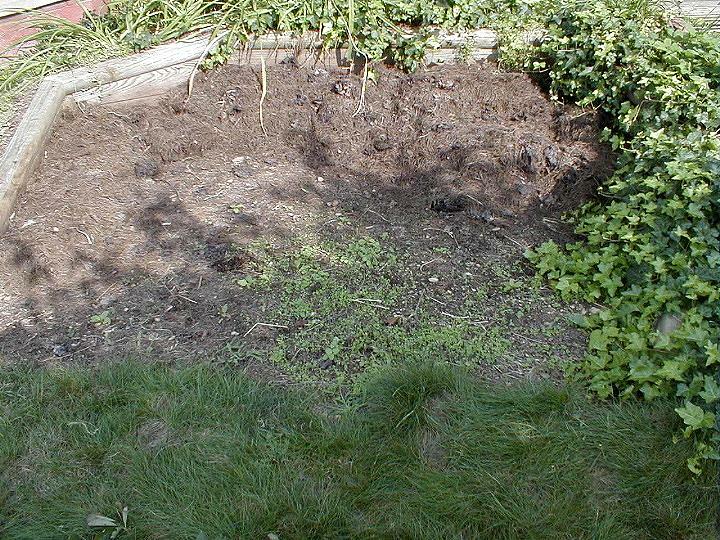 This is basically a state of brumation and it may last for several winter months. There is nothing we can do about it. It is less common with water turtles. We treat turtles in a state of brumation much the same way we would treat them if they were active. We make sure they have clean water every day and provide food several times a week. Land turtles get a soak in a tub of water once a week so we know they are hydrated and healthy. We still talk to them and pet them. The land turtles are in vivariums with plants so their environment is moist at all times. We give them the same light and maintain them at the same temperature which is just normal room temperature. We wish to stress the need for high moisture in winter. It is hard to maintain high humidity in the house during the heating season. Vivariums can dry out very quickly and the turtles as well. So we keep our vivariums on the wet side by alternating moist and wet areas. We will over water some areas but not to a point of having standing water or mud. If we were keeping dry climate turtles, we would maintain them on the moist side too. Live food like earthworms or crickets in spring is usually the first thing brumating turtles will eat when they resume eating. If such a treat is offered and not eaten, there is always a water turtle willing to eat it. Like hibernation, brumation has its risks. We could mistake illness for brumation. We watch their eyes which should be clear at all times. They should also be reasonably active after a soak in a tub of water. We will go as far as to say brumating turtles are more at risk than hibernating turtles because we may make a human error in their care. They must not be allowed to sit and become dehydrated. We could place our box turtles in the basement in something like the "ark", but that would deny them the pleasure of many warm sunny days outside. The water turtles are denied those same warm sunny days they would sit by the pond, but their pond is drained for the winter. Therefore, the water turtles must come inside. Some juvenile box turtles could hibernate outside, but they would be harder to find in spring and we would miss them. Lastly we have Emily our large Florida red-bellied turtle. She was a lost turtle we adopted. She is delightful, smart, and very domesticated. She is our first turtle who would normally be active all winter. These turtles are only found in Florida and limited areas in Georgia. She came inside with our other water turtles and was placed in the "ark" for about a month of hibernation her first winter with us. We did not trust leaving her hibernate too long so we brought her out of hibernation and set up an aquarium for her. She now comes inside and gets the run of the house for the winter. When the water turtles are placed outside in spring, Emily also goes outside. The water turtles are ready to sit by the pond on sunny days. Emily heads for the leaf pile and digs in for four to six weeks. The leaf pile is cold but warming so it is hard to say whether Emily is hibernating, brumating, or aestivating. Emily also uses the leaf pile in summer when she needs to "chill out". Sometimes when she does not get what she wants, she gets upset with me. Then she goes into the leaf pile for a few days. After a day or two, I knock on her shell a few times and she moves back to the pond. On Good Friday several box turtles emerged from hibernation, but they were not the first to do so. The turtles in the ark were also stirring in the basement. So the following day the pond was filled and all the water turtles and the wood turtle were moved from the basement to the pond. The ark in the basement was a complete success. The wood turtle and a western painted turtle spent about half the winter in the leaves in the ark and then moved to the water. Leaves tracked into the water indicated that a few turtles explored the leaves early and then remained in the water. The water temperature averaged about 45 degrees. The first box turtle was seen on February 29th and we believe it did not hibernate in the leaf pile. This turtle is named Robin because it is always the first one out of hibernation about the time robins return to our area. We usually remove some of the leaves as they emerge to allow the leaf pile to warm. The box turtles emerge over a long period of time because the bottom of the leaf pile remains cold. Emily the large Florida red-belly was a delight to have inside and was not a problem as first expected. She is very domesticated and wanted attention when we entered the room. We broke our rule of not feeding turtles in their aquariums. That was a mistake and the tank had to be cleaned after several weeks. Then we got into a workable routine. Every other day she was given some lettuce in the aquarium. The other days she was feed pellets in a utility sink where she also did her business. Then she was placed on the floor for several hours (now several days) of roaming the house. She usually ended up under a bed or in a closet. She had a very good appetite when her aquarium water was at least 75 degrees. When she did not get the attention she wanted, she could be heard thumping about in the aquarium. Since building the ark, we have been joined by some mud turtles. Mud turtles and musk turtles are bottom walkers not swimmers. They could spend the winter in the ark, but shallow water is more suitable for them. Therefore, we set up a stock tank next to the ark with only about three inches of water in it. The air pump that provides air to the ark also provides air to a bubblier in the stock tank. Our concrete covered flower pot hide box is placed in it since these turtles like to hide. When taking the pictures, one mud turtle was sitting on top of the hide box. It can not be called basking in a dark basement. More hide boxes will be added to allow them to hide or sit out of the water. The large clay pot hide box seen in Tour 18 is also being used in the ark. You can see how we made the hide boxes in Tour 17: Hide Boxes for Turtles. We have often been asked if it is okay to disturb turtles while they are hibernating to remove them from hibernation. We have never had a problem doing so. To bring land turtles or water turtles out of hibernation we simply place the cold turtles in a dry container in the house at normal room temperature. We do not do anything else to warm the turtles. We allow the turtles a day or more to warm slowly and resume activity. It may take several weeks before they resuming eating. We hope this our eleventh behind-the-scenes tour helps you address the question of hibernation of pet turtles.